Successful regenerative medicine strategies often rely on exquisite control of the biological microenvironment and supplementation with extrinsic therapeutic molecules to direct cellular behavior.1,2 These macromolecules trigger intracellular signal transduction pathways, with complex cross-talk between the cascades and eventual programming of cell behavior through transcription factors.2–4 An issue with the strategy of delivering exogenous soluble factors to stimulate tissue regeneration is that they are often required at supraphysiological doses. This can cause many issues, ranging from cost of goods to dose-related side effects or overexuberant tissue formation. Our recent work has shown that a promising alternate approach is to use recombinant transcription factors, which can be expressed, purified, and delivered directly into the cells in order to control their behavior for regenerative medicine strategies.5 Effective delivery is enabled by the discovery of high-synergy peptide domains which can modify stem cells that are hard to transfect using conventional methods. Various methodologies have been developed to deliver therapeutic proteins intracellularly6–8 with the aim of directing differentiation of somatic9,10 or stem cells11—effectively bypassing the need for growth-factor stimulation, which will activate multiple cell-type pathways. Cell penetrating peptides (CPPs) can be tethered to the protein of interest12–14 to trigger endocytosis-mediated uptake when they interact with the cell membrane.6–8 Even though CPPs significantly increase cellular uptake, their low-level activity requires there to be a vast extracellular excess to drive endocytosis, with the quantities required to elicit changes in cell behavior at micromolar scale. To overcome this inefficiency, we recently described a new technology based on glycosaminoglycan (GAG)-enhanced transduction, called IntraStem.5 It comprises a series of novel fusion proteins that couple a membrane-docking peptide which bind heparan sulfate GAGs with a CPP. We show enhanced intracellular transduction upon coupling CPPs with a GAG-binding peptide. Functional quantities of many cargos including fluorescent proteins, transcription factors, and enzymes have been successfully delivered using IntraStem, with significant increase in functional delivery compared to conventional CPP-mediated delivery and using sub-micromolar doses. Furthermore, we are able to employ controlled-release methodologies (for example, using poly(DL-lactic acid-co-glycolic acid–based delivery matrices, such as Locate Therapeutics’ proprietary TAOS® platform) to deliver these peptides in a progressive and sustained manner to cells.15–17 Engineering these peptides into the coding sequences of recombinant proteins can facilitate their enhanced delivery into a wide variety of cell types including stem cells, primary cell isolations and tissues. Many regenerative medicine approaches employ the use of mesenchymal stem cells (MSCs), as they can be obtained directly from the patient from a number of tissues, can be readily expanded in culture, and have been shown to have positive clinical outcomes in a number of trials. These cells are multipotent, meaning they can become different tissue-type cells (e.g., fat, bone, cartilage) with a predisposition to convert into specific tissue types depending on the source tissue from which they were first isolated. Methods to control or change this predisposition are key to exploiting them to repair tissue in cell therapies. Using IntraStem, we can program the gene expression of MSCs to differentiate them efficiently into bone cells (Figure 1).17 Importantly, this technique can overcome the cellular inclination to form alternative tissues (e.g., cartilage) directly at the level of gene expression. Using this approach to deliver recombinant transcription factor proteins (e.g., RUNX2) means we do not genetically modify the cells, unlike gene therapy. This can now be exploited for programming MSCs when developing strategies for repairing bone trauma and disorders. Relatedly, human MSCs can have low proliferative capacity and readily senesce in certain patient groups (e.g., diabetics and the elderly). Locate has recently embarked on a program using IntraStem to amplify their numbers, overcome proliferative shortfalls, and expedite production of therapeutically relevant numbers. The aim is that this personalized therapy will then be administered into patients using the TAOS system to further enhance clinical outcomes. Figure 1. Efficient transduction of RUNX2 (labeled with FITC) to program human mesenchymal stem cell differentiation into bone: (A) Hoechst, (B) IntraStem-RUNX2-FITC, (C) merged. Cells were transduced with 30 µg/mL protein for 12 hours. The IntraStem technology can be adapted to condense and deliver nucleic acids to cells and therefore find use as a transfection reagent. We have shown that IntraStem peptides can be engineered to form nanocomplexes’ of mRNA and pDNA, which can be used to transfect a wide variety of cell types. These formulations have recently been tested in preclinical lung-delivery models. When compared to Product B, post-transfection cell-proliferation rates are preserved more significantly, allowing serial gene delivery to be achievable (Figure 2). The cytocompatibility of the reagent therefore suits applications whereby the cells are sensitive to effects of chemical or physical methods of gene delivery. Interested transfection can be used in hydrogels (for tissue engineering and regenerative medicine), for in vivo delivery of gene therapy, and for human tissue ex vivo. The technology has also been shown useful in the generation of induced pluripotent stem cells (iPSCs) using episomal vectors (Figure 3), and in the delivery of gene-editing technologies to iPSCs to correct genes or generate disease models. Figure 2. Efficient transfection of a GFP reporter gene via IntraStem peptide (A) Transfection of 1 µg plasmid DNA was compared to “gold standard” in vitro trans-fection reagents in terms of transfection efficiency and assessed by flow cytometry. 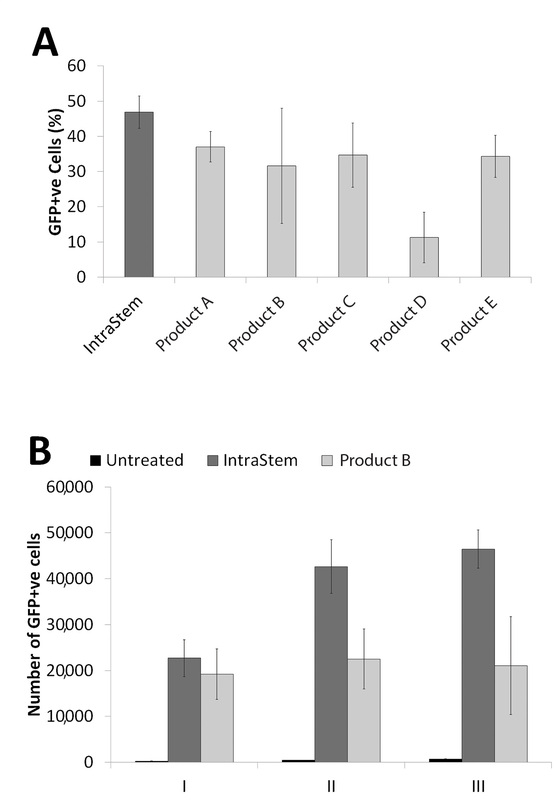 (B) The number of GFP-positive cells with three serial transfections of IntraStem or Product B shows serial IntraStem delivery can outcompete Product B in terms of total transfected cell numbers. Figure 3. 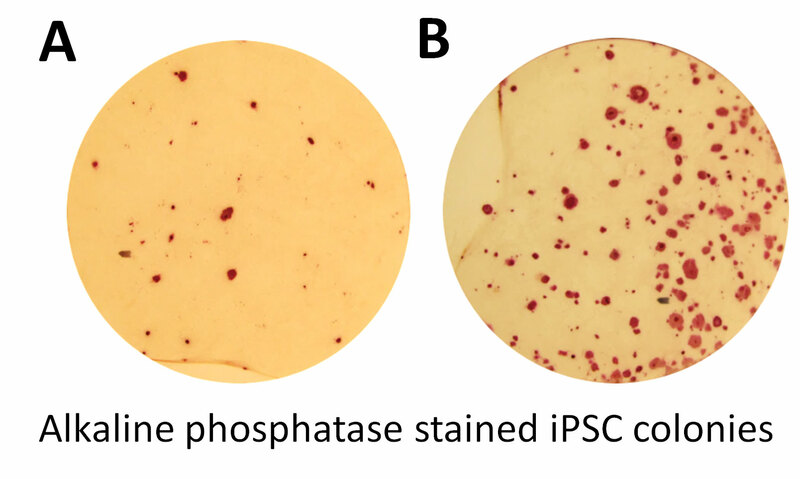 Efficient reprogramming of fibroblasts to iPSC cells using IntraStem to transfect (A) Yamanaka factor episomes and (B) a modified cocktail of factors. Colonies were stained for alkaline phosphatase activity after culturing in defined E8 media. The IntraStem peptide system allows the intracellular delivery of a multitude of therapeutic molecules across a wide range of cell types and culture contexts. In addition, its production and use require no specialist equipment and can be scaled to high-throughput to large transfection formats. The ability to efficiently deliver molecules ranging from antibodies, nucleic acids, and nanoparticle formulations using IntraStem will be a useful tool in contributing to the development of more effect treatments and allow the better understanding of disease states and stem cell differentiation. James E. Dixon, Ph.D., is senior research fellow, stem cell technologies; and Robin Quirk, Ph.D. (rquirk@locatetherapeutics), is CEO of Locate Therapeutics. 1. Sant, S.; Hancock, M.J.; Donnelly, J.P.; Iyer, D.; Khademhosseini, A. Biomimetic Gradient Hydrogels For Tissue Engineering. Can. J. Chem. Eng. 2010, 88, 899–911. 2. Ashe, H.L. ; Briscoe, J. The interpretation of morphogen gradients. Development 2006, 133, 385–94. 3. Nguyen, E.H.; Schwartz, M.P. ; Murphy, WL. Biomimetic Approaches to Control Soluble Concentration Gradients in Biomaterials. Macromolecular bioscience 2011, 11, 483–92. 4. Wolpert, L. One hundred years of positional information. Trends in Genetics 1996, 12, 359–64. 5. Dixon, J.E. ; Osman, G.; Morris G.E. ; Markides, H.; Rotherham, M.; Bayoussef, Z.; El Haj, A.J. ; Denning, C.; Shakesheff, K.M. Highly efficient delivery of functional cargoes by the synergistic effect of GAG binding motifs and cell-penetrating peptides. Proceedings of the Nat. Acad. of Sci. of the U.S.A. 2016, 113, E291–E9. 6. Copolovici, D.M. ; Langel, K.; Eriste, E.; Langel, Ü. Cell-Penetrating Peptides: Design, Synthesis, and Applications. A.C.S. Nano 2014, 8, 1972–94. 7. Torchilin, V. Intracellular delivery of protein and peptide therapeutics. Drug Discovery Today: Technologies 2008, 5, E95–E103. 8. Erazo-Oliveras, A.; Najjar, K.; Dayani, L.; Wang, T-Y. ; Johnson, G.A. ; Pellois, J-P.; Protein delivery into live cells by incubation with an endosomolytic agent. Nat. Meth. 2014, 11, 861–7. 9. Dolgilevich, S.; Zaidi, N.; Song, J.; Abe, E.; Moonga, B.S. ; Sun, L. Transduction of TAT fusion proteins into osteoclasts and osteoblasts. Biochem. and Biophys. Res. Comm. 2002, 299, 505–9. 10. Park, H-J. ; Shin, J.; Kim, J.; Cho, S-W. Nonviral delivery for reprogramming to pluripotency and differentiation. Archives of Pharmacal Res. 2014, 37, 107–19. 11. Wong, F.K. ; Haffner, C.; Huttner, W.B. ; Taverna, E. Microinjection of membrane-impermeable molecules into single neural stem cells in brain tissue. Nat. Protocols 2014, 9, 1170–82. 12. Joliot, A.; Prochiantz, A. Transduction peptides: from technology to physiology. Nat. Cell. Biol. 2004, 6, 189–96. 13. Frankel, A.D.; Pabo, C.O. Cellular uptake of the tat protein from human immunodeficiency virus. Cell 1988, 55, 1189–93. 14. Green, M.; Loewenstein, P.M. Autonomous functional domains of chemically synthesized human immunodeficiency virus tat trans-activator protein. Cell 1988, 55, 1179-88. 15. Eltaher, H.M.; Yang, J.; Shakesheff, K.M. ; Dixon, J.E. Highly efficient intracellular transduction in three-dimensional gradients for programming cell fate. Acta Biomater. 2016, 16, S1742–7061. 16. Abu-Awwad, H.A-D.M. ; Thiagarajan, L.; Dixon, J.E. Controlled release of GAG-binding enhanced transduction (GET) peptides for sustained and highly efficient intracellular delivery. Acta Biomater. 2017, In press. 17. Thiagarajan, L.; Abu-Awwad, H.A-D.M. ; Dixon , J.E. Osteogenic Programming of Human Mesenchymal Stem Cells with Highly Efficient Intracellular Delivery of RUNX2. Stem Cells Translational Medicine. 2017, In press.